I love my little adventures to Super King market in the Glassell Park area (Glendale, sort of) because I always find something I’ve never seen or tried. Today there were tart little yellow guavas, fava beans and (amazeballs!) 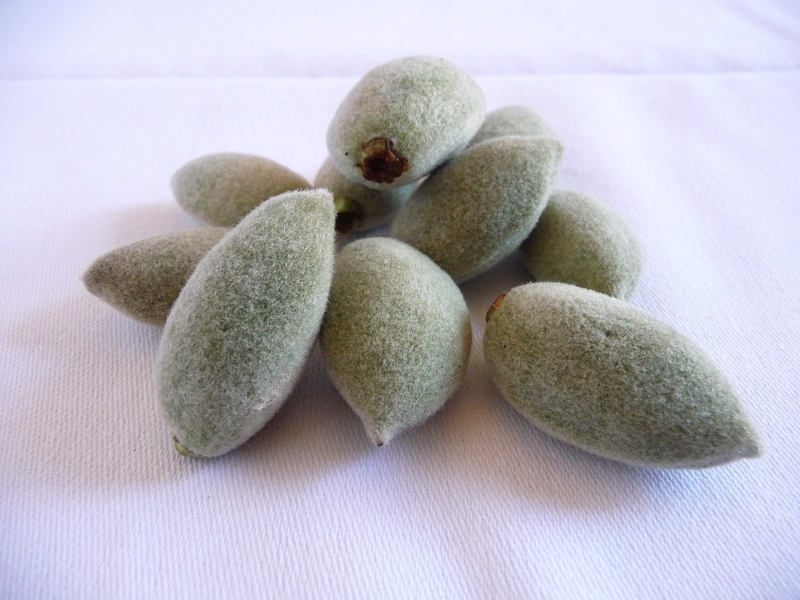 fresh green almonds. Gorgeous, fuzzy, little nubbins of a slightly sea foam color dying for me to take them home. I honestly have no idea what to do with them. One French blogger recommends I add them to some fresh jams, but the summer fruit here isn’t really good enough for canning yet. Most of what I’ve read said devour them as is, simply cutting out the raw, unborn almond out of its fuzzy cacoon. Or I could go buy like 50 pounds more, fill my bathtub with them and take a fuzzy almond bath. Perhaps I could get a sharpie and draw little faces on them, line them up in a row and play toy soldiers. Maybe I should string them into a necklace and wear them around the house for Walnut to admire?